You can return to our walls page or browse the pictures using the next and previous links. 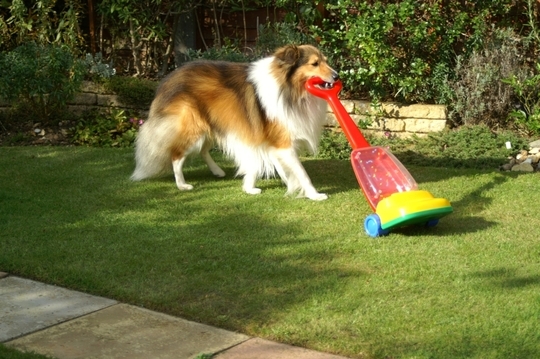 As autumn approaches, my Sheltie, 'Conker', helps to tidy up by vacuuming the leaves from the lawn. He is available for hire, but might charge exorbitant rates per hour, and would expect regular breaks for biscuits. Special reduced prices for all GoY members. Conker says, thank you, Michaella. Beutiful dog! I see you figured out the photo thing, so just ignore the message I sent you! Oh, he's really beautiful TT, gorgeous coat, what a lovely pic! On your photos,she looks lovely standing at the water's edge. Thanks, Gillian and Janey for your advice when I was struggling to resize my photo to put on my homepage. Yes it took me ages to work out how to get the picture accepted by GOY. Beautiful Dog Terratoonie and welcome to GOY! Pansypotter, I'm so pleased you like my little helper. Being a Sheltie, he thrives on stimulation, such as doing tricks. It sounds like Polly is doing her bit with the digging. Does she do double-digging? That's quite an art! It's a good thing that Collared doves seem plentiful. Most pairs have several sets of baby doves each summer. Thanks for your welcome from Washington. I'm glad you like Conker. Today he was practising his gardening theme tricks on my lawns. He has his own little mower - which I imported especially from the USA - you can't get suitable ones in GB. Conker is so clever and beautiful too. Our dog Scooby would run a mile frightened of vacs and mobs complete wuss takes after his name sake mind you scooby snacks don't have the same effect which is a shame lol. By the way welcome. With autum on it's way you coud be on to a gold mine. I'm so pleased you like Conker. I could do with some help in my gardens, so if he's looking for a job? Conker would enjoy helping you with your garden jobs. In my 'avatar' photo, my Welsh Terrier, whose name is 'Bonsai' is pushing his little wheelbarrow full of toy garden tools. Conker likes tidying. He can stack 6 plastic saucers inside each other, and he then places them in a flower pot and parades around with the whole lot. So, Philip, Conker would certainly tidy up for you and he has his own plastic rake, plastic spade, toy tape measure, and watering can. Being a Shetland Sheepdog, he likes to work FAST. How's that for a Sheltie CV? Is he hired ? You have obviously decided to train 'Conker' and 'Bonsai' as an Animal GroundForce maintenance team. That is genius, mind you I should imagine you must spend a fortune on treats and dog biscuits. Hey but then you think of the savings on Tea-bags and Milk! Thanks for the comment on my cat - Blue - it was a Bird Table - when originally delivered but the cats seem to like sleeping in it. Which unfortunately puts the birds off. If we are the Ground Force, team, I reckon my Welsh Terrier is Tommy, and my Sheltie is Alan Titchmarsh. In June 2008 a charity dog show was held near you, Brian, at Saffron Walden County High School, in aid of the school farm. Maybe you know about this excellent scheme, where the youngsters learn lots about growing many types of vegetable, collecting eggs from chickens, etc. Wouldn't It Be Good If He Could Cut The Grass? TT Hi ,I'm sure Scooby would get on great with Conker and he could teach him a trick or too, Scooby is very bright but just can't get fetching sometimes i think he thinks he's a cat he comes to puss puss any way bless. Brian I agree ground force eat your heart out nothing on Conker and Bonsai. Well done for all of the charity work i work full time for one myself very rewarding. I bet the children loved watching them. Big gold star for you and your fury friends. I think if I want to give up cutting the grass I'll need to hire a goat. Yes, all the dog shows are in aid of very good charitable causes. Does Conker expect a 45ft trailer with air conditioning, mini-bar and 24 hr maid and security service at these events ? If not, why not ??!! :-) He's a star ! Conker has seen your green photo silhouette, Cluelesskev, and would like to hire you for the security service bit. You been speaking to Crystaltips ? I'm not set up to do much photography right now, but if I can, I'll try to get a picture of the worm-on-wheels. You got that one right Crystaltips! I have now dubbed her "loonietooney"! 3 photos TT you spoil us . Love to Conker from Bonkers what a team we d make.Mind you might make Mary parrot jealous.Jane has taught her to include the word ' mad ' when talking to me! I now get hello mad daddy - shut up mad daddy etc . sort of canine version of Bonkers, I guess. Jane sounds like a good 'mad' parrot-trainer. I'm currently preparing myself emotionally to upload a FOURTH photo next week. I might need to book in for some GoY therapy sessions afterwards. Aye she did thanks TT but feels a combination of bonkers perhaps a little too much even for this tolerant site. awwww bless, it puts a new meaning of helping around the house lol. lovely dogs :o), mine is called Pebbles. Whats yours called? The Sheltie's name is Conker. Your dog, Pebbles is so cute. conkers and pebbles are sort of the same shape ! My Conker is on the other photo, too, sitting next to the model dog. Conker just said hi to you under the other photo ! beautiful collie, and so clever too. The Conkers have just started to fall from the trees. Picked one up yesterday. SHe has got those browny tones hasn't she. We were making comments to each other at the same time! I've just left a message under your cat in a basket ! There's a story to how Conker got his name. Rather long, so maybe I'll put it in a blog over the winter! Sorry I did forget to look. Had lots of bathroom leak plumbing emergencies this week, and then went back to clicking photos I like instead of clicking on your video! It's a good poem and footage. I especially like the part where Twinkle is drinking from the tap, but the spare water falls in the can. No wastage! Such talent Conker has, never tried the vacuum thing? I just do not think the boss would let me do this with her Electolux! Maybe the central vac. Conker does far more housework than I do. Lately he's been practising his cleaning trolley routine, where he tows a trolley then stacks up all the buckets and brushes on board. That is so cute terratoonie. what a (bone us) to your family. Lots of leaves on my lawns right now. Well you a lot nicer neighbour than I am. I get out my blower soon as I see my neighbour leave for the day to work then blow them back to his lot. Just pulling your leg I bag them up for recycling. You obviously have a good understanding of animals and their behaviour because you ask all the right questions. I've learnt that each dog needs to be trained differently. Never teach for too long in one session.. Know when to stop. The way Conker got his name is a weird tale which would take too long to tell here. Conker the Sheltie will do all your garden work for you. Lovely dog! If he is ever in the States, he can come do my yard. I have lots of fresh made liver treats! Conker would have great fun steering his vacuum cleaner around your yard.. Lol. The treats sound good !!! Terratoonie,you are very happy with this dog.I love him! I'm pleased you like my dog, Conker.